Nicholas Alexandrovich Romanov was coronated "Emperor and Autocrat of All the Russias." He complained that he was not ready to be tsar and, it is said, burst into tears. He had little interest in ideas, but he tried to model his rule after that of his father, Alexander III, and to adhere to ritual and ceremony. A few days after his coronation, as a part of the continued celebration, presents such as trinkets were made available to the public at a field on the outskirts of Moscow. As the crowd surged toward the gifts over a thousand of them were trampled to death, the beginning of tragedy for Nicholas' reign. The main interest of Nicholas was devotion to God and an undisturbed family life. He believed the Romanov claim that rule by the Romanov family was from and guided by the will of God. Like his father he was the head of Russia's Eastern Orthodox Church. Under Nicholas II, Moscow was still seen as the new City of Constantine, the "Third Rome," as it had been since the 15th century. At church services Nicholas II was described as "'The Most Devout" and the Church as having reached its fullest development and power under Nicholas. Nicholas visited churches across his land, venerating saints, and where he appeared, devout Russians followed the custom of falling to their knees at the sight of him and his entourage – a moment of silence usually followed by roaring cheers. Those allowed close enough to him and allowed to address him would, on their knees, kiss his hand with fervent expressions of loyalty. Russia's wealthy merchants did not lobby for a voice in government as had merchants in the West. Many of them were from the "Old Believer" families, risen from poverty and frugal. Largely they accepted the policies of their tsar, aiming their hostilities instead at would-be business competition from Western Europeans, from Poles and Jews. They remained actively associated with the Orthodox Church and supported, or at least did not criticize, Russia's imperialism. Dissent was strongest among intellectuals with an anti-capitalist bent. And perhaps in part as a counterforce to the religious intensity connected with the monarchy, atheism was fervent among those opposed to tsarist rule. It was Russia that was producing the most revolutionaries – more so, for example, than was liberal Britain or the United States. Russia's revolutionaries were divided between anarchists, Narodniki and Marxists. The Narodniks were anti-city, socialist and interested in organizing Russia's majority rural folks. The Marxists believed that industrialization and urbanization was in Russia's future and that socialism would follow more industrial and capitalist development. They saw Russia's village communes as decaying and peasants increasingly joining the urban poor. The most influential Marxist was George Plekhanov, living in exile in Switzerland. He became one of the founders of the League for the Emancipation of Labor – the beginnings of what became Russia's organization of Social Democrats. Plekhanov criticized anarchists, Narodniks and Blanquists for not understanding that socialism could not be superimposed upon the present but instead would need to wait for more capitalist and industrial development. In 1900, Plekhanov would begin publishing the Socialist newspaper Iskra (spark) in collaboration with others. Among the others was a rising star among the Russian Marxists, Vladimir Ilyich Ulyanov, a former student who have suffered under tsarist rule, who was to be known to the world as Lenin. Lenin believed that a revolutionist party in Russia should be clandestine and limited to professional revolutionaries who could take their reasoning to common working folks rather than waiting for the "working class" to spontaneously develop an interest in socialist revolution. In 1903 he would lead a split among the Social Democrats, his group called the Bolsheviks. 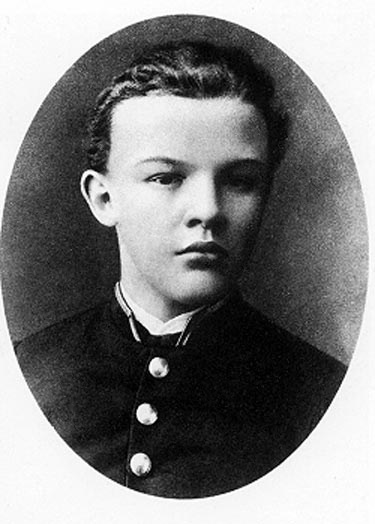 Lenin around 1887 and the age of 17. He was bitter about his older brother, a student organizer, having been hanged. He too was an activist and was arrested that year and sent to Siberia. The industrial sector of Russia's economy began booming in the mid-1880s – similar to the booms taking place in the West, including the United States. Russia's rail track increased to around 53,000 kilometers by the end of the century. The trans-Siberia railway, begun in 1892, was then almost finished. From the hub of Russia's rail lines in Moscow, rail lines extended to the Far East, westward to Warsaw and the Baltic Sea, north to St. Petersburg and to Archangel, south to the Black Sea, and southeast to the shore of the Caspian Sea and to Samarkand and the Afghan border. The century ended with many Russians holding a romantic notion of the expansion to the Siberian Far East – which had become a part of Russia proper. In a popular book titled The Conquest of Siberia, the author, Alexander Ermak, described the people migrating into Siberia as "strong, with a powerful spirit." Life in Siberia, he wrote, was tough. While people in Western Europe viewed expansion by Russians as sinister, Russians commonly viewed their expansion as glorious and the product of bravery and fortitude.